I hope everyone reading this had a lovely and memorable holiday season, and that 2015 looks at least as bright if not brighter than last year. As some of you know, my kitchen underwent renovation, and became fully functional again on Black Friday. I went a little crazy in my meal planning last month, purely from just having countertops and running water in the kitchen again. Seriously, I made three Christmas dinners from varying traditions. It was a blast. Oh, then there was my adventure into French cuisine – finally, the beer drinker has a purpose for wine! I’ll save that for another time. For this week, I offer you food that encourages the holiday spirit, without the bickering relatives and consumerism. Grandma sounded almost nervous as she said, “Well, that’s a little over a pound a piece, so I guess that could be enough.” She went on to make eight dozen devilled eggs to go with the ham. Believe me folks, I know the struggle. So for your leftover ham, give this a try. I think one of the reasons I like this for leftovers is that it changes the texture of the meat, so you don’t feel like you’re eating another freaking slice of ham. It’s going to sound weird, but today folks, we’re making ham loaves. Yep. Like meatloaves, only smaller, and happier, because they come from a pig – pig meat is naturally happier. Bear with me folks, I’m coming off a six-week food bender; I may not make the most sense. Just trust me, I know good food when I taste it. Besides, this recipe is from The Joy of Cooking, and they’ve never steered me wrong. Textured like meatloaf, tastes like ham. Can’t go wrong with that. In a food processor, pulse the ham until coarsely ground, then add the bread crumbs, eggs and mustard and pulse until well mixed. Let stand 10-30 minutes, while your oven preheats to 375 degrees. Press the meat mixture into six 3-inch cakes. Set aside. Grab the can of pineapple, drain and reserve the juice. In a large, non-stick skillet, heat 1 Tbsp. vegetable oil over medium heat. Place 6 pineapple rings in the skillet and cook until lightly browned, about 3 minutes per side. Transfer slices to a shallow baking dish large enough to hold them in one layer. Set aside. Add 3 more tablespoons vegetable oil to the skillet, and when it’s heated, add the ham cakes and leave them there until the undersides are browned, 3-5 minutes. Turn and cook 3-5 minutes longer. Place each cake on a pineapple slice. Add one last tablespoon of vegetable oil the skillet, and when it’s hot, add the sweet potatoes, brown sugar, and cloves. Cook, turning the sweet potatoes gently with a spatula, until glazed, about three minutes. 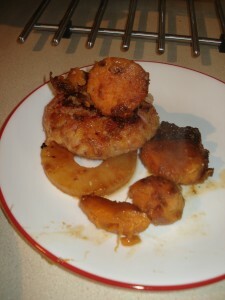 Place a chunk of sweet potato on each ham cake, and scatter the rest over the bottom of the baking dish. Pour the reserved pineapple juice into the baking dish, then bake until the juices are bubbling, about 30 minutes, baking the ham cakes a few times just before serving. My second offering may well become a staple for special occasions. For those who haven’t had the delight, yorkshire pudding is the happy place where dinner rolls meet french toast. Yeah, I know how American I sound talking about a British dish, but it’s the only way I can really explain it. It’s a crepe-like batter baked in the drippings of a roast, usually prime rib. This is yet another time where Ree Drummond has shown me the light, and I hope for many blessings upon her house for it. That said, yorkshire pudding is a dish that sounds fancy, but it surprisingly easy to make. It takes some attention, but nearly anyone can make it. The roast I made didn’t make enough drippings for the recipe, so we rounded it out with beef broth and a bit of vegetable oil. 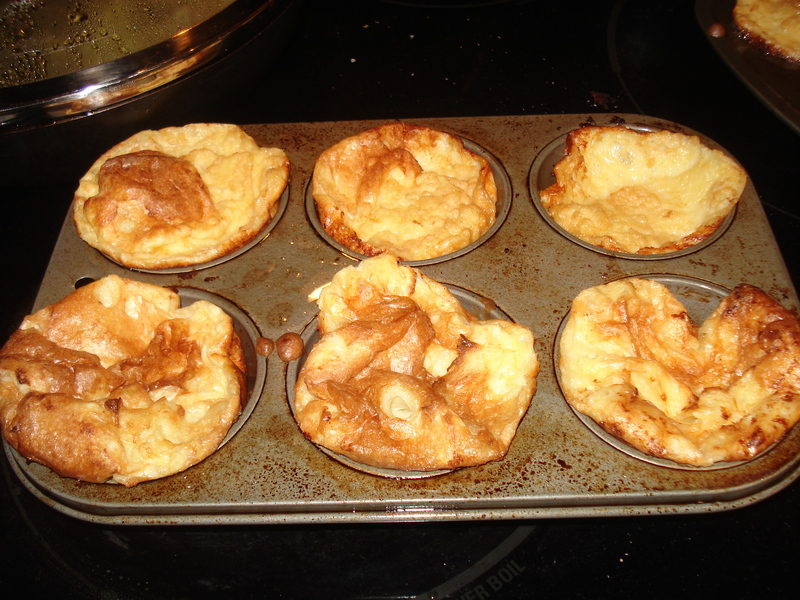 They’ll pop in the oven, and deflate quickly, as seen here. Approximately 2 Cups roast drippings. In a large mixing bowl, whisk together the eggs and half and half, until well combined. Then sift in the salt and flour. Easy, right? It should be a thin batter. If you do this while your roast is still finishing, no worries, pop it in the fridge until you have the drippings collected. Tip of the week: When in doubt, add butter. ← Hawks beat Clippers in L.A.